All > Sports > Baseball > DO NOT USE THIS CATEGORY! Some of the most sought after collectibles in the entire sports collectibles industry are items pertaining to Joe Jackson, the fantastic Hall of Fame caliber baseball player who was banned from the game for life in 1920. Especially of interest and important are the tiny cardboard relics which carry his image. Unfortunately for vintage card collectors, there are precious few issues which contain a Joe Jackson card. For those which do, these Jackson cards carry exorbitant price tags. However, one fact we have seen within this great hobby of ours, are the ultra-rare items, the items which appear every decade or so, have no shortage of collectors who have the desire, and the resources to own these collectibles. Um…sorry, but it is highly likely you really didn’t. And while this item was thought to exist, it hasn’t been pictured (or authenticated) until now. In fact, this card is so rare that veteran collectors of the 1917-20 Felix Mendelsohn issue, those who have collected these beautiful cards for a couple decades have stated they have never even seen a photo of this card! Felix Mendelsohn was a publisher of baseball card sets back in the 1910s, primarily offering his cards in The Sporting News, then known as “The Bible of Baseball.” Mendelsohn first began issuing cards via the Sporting News in 1915 and 1916, within sets now catalogued as M101-4 and M101-5, offering sets of cards for a few dollars each. Plus, Mendelsohn often sold his blank backed sets to product manufacturers who had printed their own company names on the backs and distributed to customers. But, a year later he embarked on a much bigger project, a larger card set in both dimension and scope. It was then he produced these 4-1/2” x 6-1/2” black and white cards, with many subjects featuring never before seen photographs! Photos so beautifully different, most, if not all have never been used within any other issue. It’s as if the collecting gods said, “These photographs are so beautiful and majestic, we have to stop distributing these images.” Simply put, these photos are stunning. The cards were offered in advertisements back in 1917 in large groups, but it is apparent today many of these were never distributed. If they were, there would as plentiful as its predecessors. In fact, until recently the M101-6 Mendelsohn’s were virtually unknown to most of the hobby. The current checklist stands at 123 subjects, but the complete checklist will likely always be incomplete. That is how rare these M101-6 Felix Mendelsohn cards are. Many say the Babe Ruth card, of which there are two, is the most highly desirable card in the set. Ruth is featured in both as a Boston Red Sox player, and then reissued as a New York Yankee team member after his trade before the 1920 season. But it is now time for even the great Babe Ruth to step aside, as there is a new king. Babe would likely have no problem with this changing of the guard as he idolized Joe Jackson. Babe once said, “I copied Jackson's style because I thought he was the greatest hitter I had ever seen, the greatest natural hitter I ever saw. He's the guy who made me a hitter." From the Babe’s mouth to your hands. This offered Jackson M101-6 Mendelsohn has an image so historically significant, it will send shockwaves through our hobby. Joe Jackson is smiling and swinging a bat, but not just any bat. Jackson is swinging The Black Betsy. Is there any wonder why he is smiling in the photo? All the stories after the fact about who now has the real Black Betsy, the bat Jackson used for most of his career, the bat which never broke in 13 seasons of constant use. Was it in Cooperstown? Did Jackson give it to the mayor of Greenville, SC (Joe’s town) as it states in a 1942 Sporting News article? Or was it in fact passed down the family lineage and sold a few years ago for an astronomical sum of money? Well, it doesn’t matter where that bat is now, because everyone knows where it was in 1917. Jackson had it in 1917! With knuckles whitening, and forearm veins bulging, Jackson is swinging his Betsy. It is clear as day with tape placed on the handle, just above where his hands are clenched. And we know this image was taken in 1917, the first year Mendelsohn distributed this set. A week before the 1917 season was to begin, the United States declared war on Germany – and we were now involved in World War I. Both Chicago teams showed their solidarity by putting American Flag patches on their sleeves for the 1917 season. Joe Jackson in this image, while swinging THE Black Betsy, is wearing a 1917 White Sox jersey, complete with American patch adorning his left sleeve. While the image is clearly from 1917, this does not indicate this cards was issued in 1917, as the card could possibly have been distributed in 1919, the famous Black Sox scandal which took down Jackson and seven teammates. To reiterate, we have the first authenticated example of this ultra-rare card of Joe Jackson, in an image never before seen, who is swinging THE Black Betsy, while wearing a uniform to honor the United States’ involvement (and its brave soldiers) who will fight overseas for our continued freedom. It also is one of the few cards issued of Jackson during his most famous season. 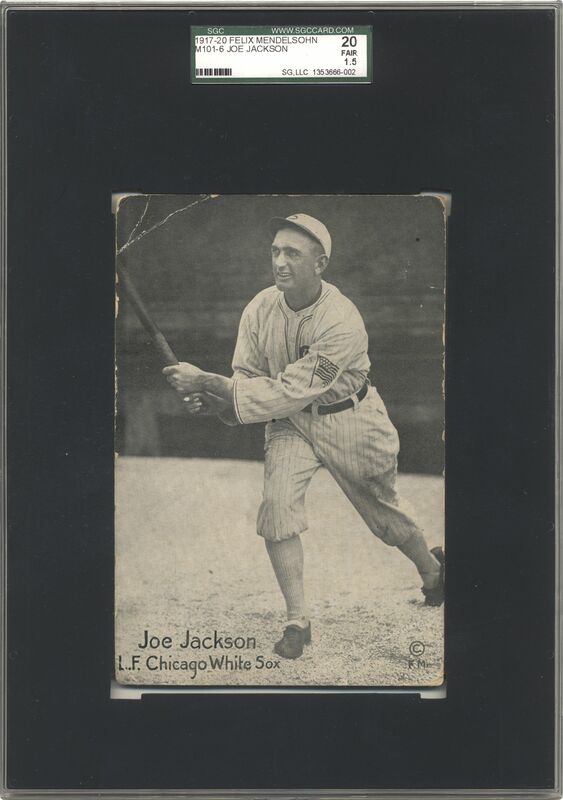 After publication of our feature catalog, and subsequent press releases, we were informed by an old time established collector that an M101-6 Felix Mendelsohn Joe Jackson card was listed in an auction catalog in 1994 (listed as a 1919 image). However, as of Friday, November 1st, 2013, we have yet to be provided with any image of said card. Goldin Auctions researched this card and issue extensively, and found several long-time M101-6 collectors who had yet to even see an image of this card until this offering. In addition, the two most prestigious third-party grading services, SGC and PSA, have yet to authenticate or even see any other M101-6 Joe Jackson card. This card has been graded by Sportscard Guaranty Corporation (SGC) as a 20 FAIR 1.5, accurately assessing the technical evaluation of the cardboard, but not accurate to the image on the card. And that is the key with these rarely offered M101-6 gems, the images. The veteran collectors who attempt to accumulate these relics are primarily cognizant of the image quality. They know the scarcity, they know the peripheral condition will not be MINTY, but they collect these cards because they love the images. While this image is fantastic, this card does contain multiple creases, most which are restricted to the corners and do not intersect Jackson’s image. The first is a 1-1/2 inch crease across the upper left corner, not touching the Betsy, but close enough to appear as a bolt of lightning flowing into the bat, similar to the lightning flashes caused by Roy Hobbs’ the “Savoy Special” in the Natural. The other significant corner crease is in the lower right quadrant, a 2-1/4 inch crease underlining Jackson spikes. Both these creases are reminiscent of the old photo album “corners” those triangular holders which kept the photos safe and secure. In addition, there is a 1-1/2 inch semi-circle type wrinkle along the right edge which impedes into Jackson left shoulder. This wrinkle is not noticeable unless the card is tilted towards one specific angle. The lower left corner has a very small crease. The reverse has a stamp, not a printing stamp, but an actual affixed stamp (measuring 7/8” x 1-3/16”) which reads, “HELP TO LESSEN THE BURDEN OF WAR.” This was a World War 1 era stamp issued to generate revenues for the war time effort. However, the key is still the photo of Jackson, one which is very pleasing and never before seen. The image is crisp with superb registration, so clear you could count the pinstripes on his jersey. This image exhibits the relaxed Jackson, who was coming off his best season with Chicago to date in 1916, where he hit .341, banging out 202 hits including 21 triples. Jackson was traded to the White Sox in the middle of the 1915 season, and slumped during the rest of that first year in Chicago. Critics harped how Jackson was “done,” but we all know that was not the case. As mentioned earlier, there are precious few Jackson cards available, most being the typical small stature issues which so permeated the marketplace back then. The Jackson rookie card, noted as the E90-1 American Caramel (picturing Jackson as member of the Philadelphia A’s), measures a scant 1-1/2” x 2-3/4.” One other highly desirable (and quite expensive) card is the T210 Old Mill Minor League card, measuring 1-1/2” x 2-7/8.” Two more very valuable cards of Jackson are the 1911 T5 Pinkerton Cabinet card and the 1914 Boston Garter advertising-type card. These two cards are much larger than the norm. 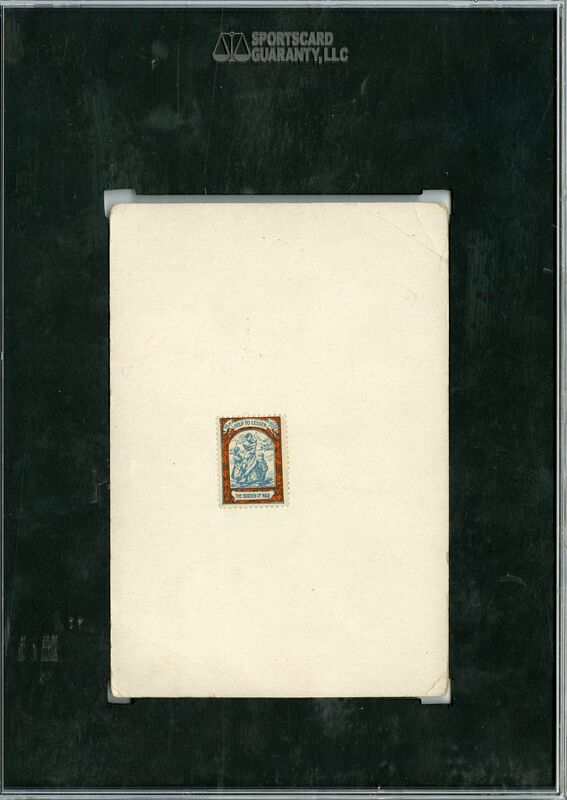 This is what Felix Mendelsohn had in mind when he created this masterpiece M101-6 issue, not issuing similarly small cards as he had previously done, not with flimsy photos affixed to a cardboard mount, or colored drawings representing players. He wanted a solid, American-sized card with real photographs. This is what this Joe Jackson M101-6 card provides, an American muscle-card, one which should provide spirited bidding. Valuations are always difficult to predict, but like economists predicting the Gross Domestic Product for the next fiscal year or Al Roker predicting the weather, it is a virtual crapshoot. The only way is to take prior models and extrapolate what you believe should happen. Therefore, we have researched most prior sales of high valued Joe Jackson cards and of the Babe Ruth M101-6’s which have traded via auction. There have been multiple sales of the T210 Old Mill Joe Jackson over the last several years, ranging in price realized from $93,000 for a PSA AUTHENTIC in 2005 to a PSA 3.5 fetching $199,750 just two years ago. Almost all recent auction examples have traded for over $100,000, including another giant price in 2008 of $165,000. A 1914 Boston Garter Joe Jackson sold for $103,000 in 2006, and in the same auction a 1911 T5 Pinkerton Cabinet of Jackson realized $182,000. However, the population reports of the two primary grading companies, PSA and SGC, have reported a total of 16 graded examples of the T210 Old Mill card; and there are a handful of known examples, both professionally graded and “raw,” of each of the T5 Pinkerton and Boston Garter Joe Jackson cards. Even Jackson’s rookie card, the E90-1 American Caramel has over 123 professionally graded examples. For comparison sake, at this writing, only a total amount of 91 M101-6 Felix Mendelsohn’s of all subjects have ever been professionally graded. Over the last several years the M101-6 Mendelsohn’s values have skyrocketed. Several graded examples of Babe Ruth have changed hands with higher prices at each occurrence. A M101-6 Mendelsohn Ruth, graded by SGC at 40 VG 3, traded for almost $4,000 in 2007, but this same card realized $16,730 five years later, over a four-fold increase. However, a PSA 5.5 M101-6 Ruth sold for over $44,000 last year. With the staggering values realized for any Mendelsohn trading hands at auction, more collectors have become aware of this very exciting and beautiful issue. They have been taken by the highly beautiful images never before seen, quite frankly, many representing some of the greatest photos ever to appear on any baseball card. Because of this, most M101-6 Mendelsohn cards as of late, even commons, have become very desirable and in tremendous demand. This offered M101-6 Joe Jackson card is the only authenticated example. It is complete with a never before published photographic image of a smiling Joe Jackson, swinging his favorite piece of hickory, foretelling of another line drive launched into the outfield gap. This M101-6 Joe Jackson is THE undisputed hobby rarity. As a long time hobbyist and active M101-6 collector recently stated, “I have never even seen a picture of the card.” Well, here is the picture....and the actual card. Now, seeing the image of this card is great fun for most of us, but wouldn’t it be really great to own this card? This fantastic, and ultra-rare card provides the first opportunity for anyone to own this Joe Jackson card. While Goldin Auctions has sold the famed “Jumbo Wagner,” realizing over $2.1 million plus many other of the hobby’s greatest sports cards, we are extremely proud to offer this one of a kind gem, the first authenticated 1917-20 M101-6 Felix Mendelsohn Joe Jackson baseball card, one of the card collecting hobby's extreme rarities. SGC Graded 20 FAIR 1.5.